The painter Rokotov became famous as a skilled portrait painter. In his preserved creative heritage there are wonderful pair portraits of the Surovtsev couple. A representative of a noble family married the born Pashkov. Varvara Nikolaevna and her husband Surovtsev were painted by Rokotov in portraits in oval frames. A special grace is different style of creating a female image. The artist carefully worked out the external details of the appearance of Surovtseva, but no less attention was paid to her inner world. 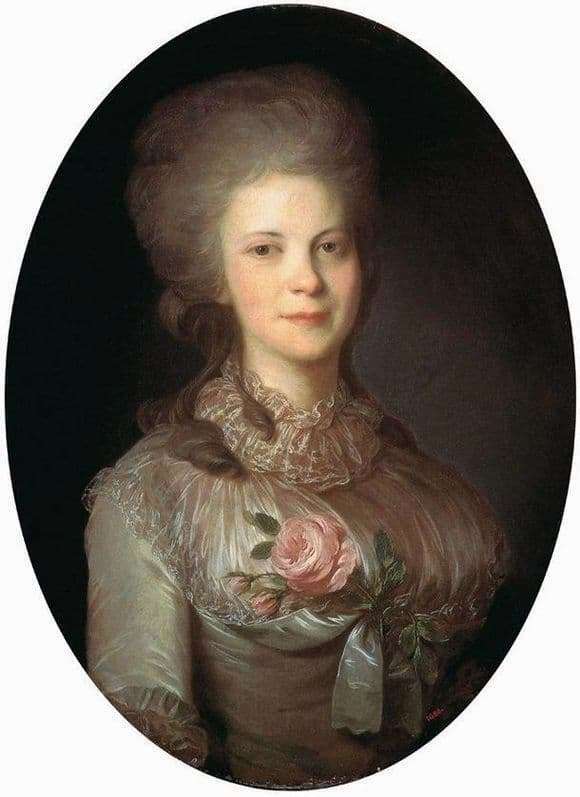 The image of a young woman made in the Rococo style, in the 1780s. The author writes a portrait of a Russian lady with a hairstyle characteristic of those times and in a beautiful dress. The colors of the beige and silvery tones of her garment shimmer like mother of pearl. The decollete is decorated with a pistachio ribbon and a branch of a lush rose. Hair from a bright forehead is combed back and powdered. Several curled curls frame the thin neck of the heroine. The face Surovtseva young and ruddy. Look pensive, serious and somewhat sad. A barely noticeable half-smile adds a romantic charm to the woman. The image of Barbara presents the audience full of spiritual beauty. The soft and kind face of the model delights the Russian artist. The painting technique in the “Portrait of Surovtsev” possesses the features of lightness and undoubted mastery of the portrait painter. With confident and rapid movements of the brush all the features of a woman are painted, which stand out with light colors against a dark oval background. The delicate pink flower petals on the dress of the model resonate with a fresh blush on the face. Pearl, iridescent tone of the portrait is the best possible way to a beautiful female image. Fedor Rokotov created a portrait with the reflection of the whole depth of feelings of the heroine. Viewers can only admire this fine mental work.